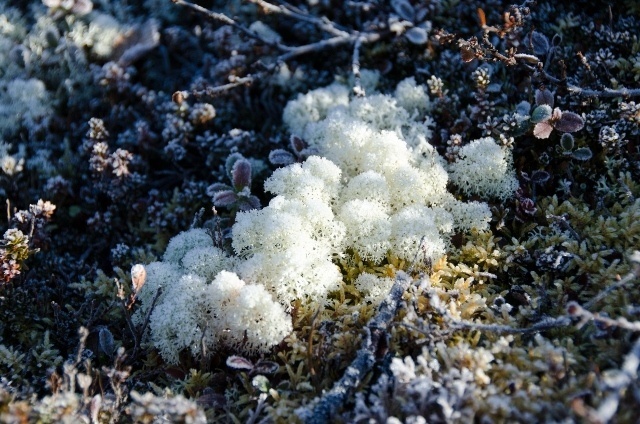 by Andy Higgs in Europe, Features, Home, Norway, Places. Today sees the start of another new series; this time the plan is to cover weekend breaks; but rather than provide tips on what to see and do these will be written after a specific experience – more like a trip report where we detail all aspects of our weekend away. The experiment is to try to get away for the weekend every few weeks and see what fun we can get up to from Friday to Sunday. Initially we will be focusing on Norway as we aim to expand our coverage of this fine country we live in, but later we’ll be including other places too. The key elements are that the trip must be doable in three days and preferably be something for all the family. 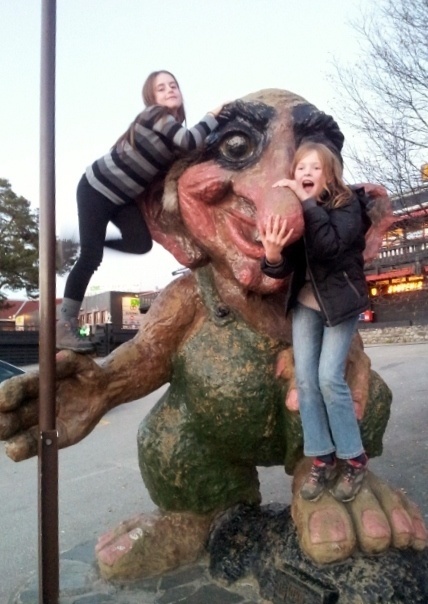 To kick things off here’s what happened when we booked a weekend away at a mountain hotel in Norway at the beginning of the school half-term – and discovered a great alternative to a city break. To get away after school on Friday and return on Sunday afternoon/evening – with enough activities to keep our daughter and her friend occupied for the entire stay while also appealing to us oldies. Er, this was a little strange. Initially we were considering staying in or near the town of Røros. 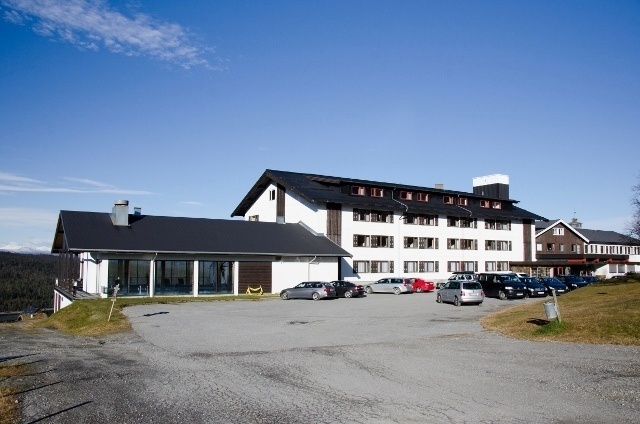 Our neighbour had recommended a mountain hotel nearby and I think that’s what I searched for – mountain hotel Røros (in Norwegian). One place that appeared high on the list of results was Wadahl Hotel and it looked great; especially as there were extra events laid on for the half-term weekend. 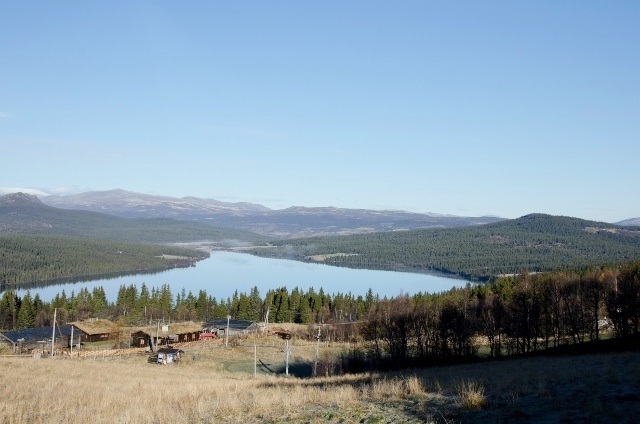 It was only after deciding on the place and checking the details that we found it was way further south than we thought – and in fact closer to Oslo than our base in Trondheim (albeit not by much). It would involve a 4-5 hour drive but we had our hearts set on it, so that was that. 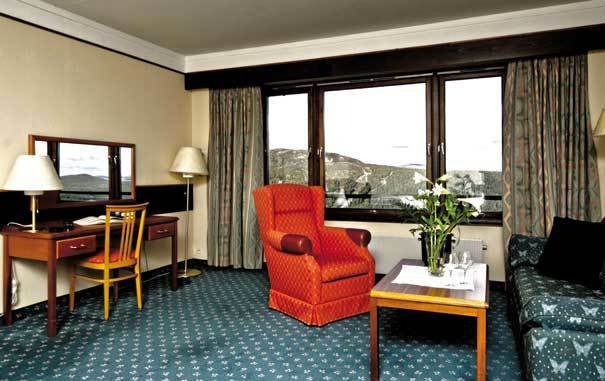 NOK 3400 for two nights half-board (i.e. breakfast and evening meal included), two children free with two paying adults. The hotel has its own indoor swimming pool and is surrounded by marked hiking/biking trails. During the half-term period horse-riding was available (1,2 or 3 hour sessions) and on the Sunday a local event company would be offering free activities on the hotel grounds (climbing, archery, air rifle shooting, frisbee golf). We left home right at the start of the rush-hour (if you can call it that) in Trondheim so wasted a good hour or so getting on to the main road south. Once we were underway it was easier, and with a few breaks on the way (including the obligatory Troll-climbing at Dombås as shown above) we made it in about 5 hours. The weather was good and the views en route are fantastic so it’s a lot more interesting that 5 hours on a motorway. It was dark when we got to the hotel, which was easy enough to find using the directions from the website. We were told that dinner was served until 2030 but that there was no need to panic as many guests arrived late on Fridays. We were asked to call reception with an update on our whereabouts at 2000 and that in the worst case scenario they would always be able to make us a cold dinner. It should be said that this was the kind of great service we were already getting used to just from the few phone calls we’d had with the hotel, and it was reflected in our welcome when we got there around 2045. We went straight to the restaurant where we were shown to what was to become ‘our’ table for the weekend. After deciding that we’d all take the same for dinner (there was a four-course fixed menu or children’s buffet with the usual pasta, hotdogs etc.) and chose a wine and soft drinks which cost extra. The food was a revelation; we had scampi as a starter, followed by mushroom soup and a main course of deer steaks and topped off with creme brulee. The kids opted out of the latter and switched over to the self-service ice cream bar for dessert. The dinner alone would have had a high price tag in a Norwegian restaurant, so to have it included in our package was superb value. Suitably refreshed, we headed off to our room to unpack. Note that I didn’t take any pictures inside our room but the picture above found online gives you a good idea of the standard. We had a family room with twin beds, a sofabed and an extra single, as well as plenty of space, a couple of armchairs, old-school TV and minibar. We’d all have preferred wooden floors to carpets but there you go. There was a balcony with outdoor seating which would be great in the summer, and the view over the water and forest was wonderful, although we didn’t realise that until daylight. The bathroom had a bathtub with shower curtain and was a reasonable size. All in all the room was showing its age but very comfortable. The beds were fine too and we all slept very well; there’s no better testimonial than that. On Saturday we woke to a perfect autumn morning in the mountains – blue skies and sun and crisp, fresh air. We’d booked an hour of horse-riding for the girls at 0930 so were up early enough to get some breakfast. This was a buffet with the usual variety of cold and hot offerings – as well as a few things they could have left out like sweet biscuits which the girls made a bee-line for, naturally enough. We ate well though and were ready for the day’s activities. After meeting the girls and a picnic lunch in the forest, we returned to the hotel to find that the afternoon’s activities had begun. A local company, Gålå Event, had set up a frisbee golf course in the hotel grounds and there were plenty of other things to try. 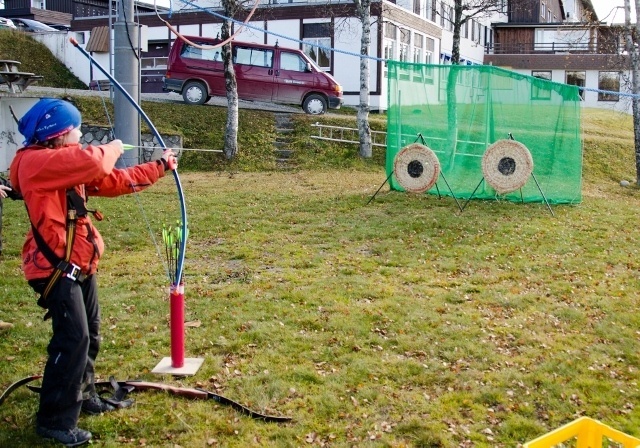 Archery is always popular, especially for those with an above-average interest in Vikings. Finally it was time to try out the air rifles. 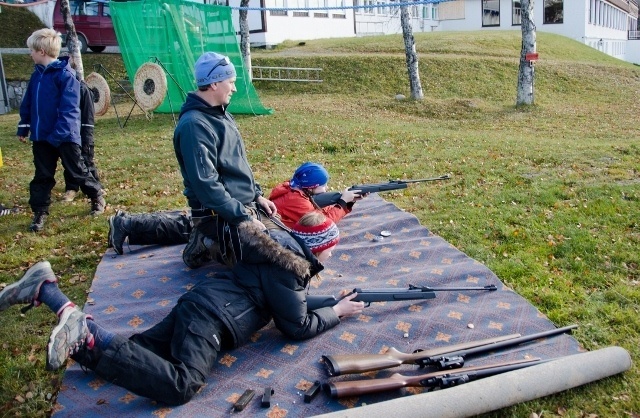 A team event was also organised where participants were divided into pairs who then had to race on skis (that’s two people on one set of skis, on grass) round a course then shoot targets at the end. All good fun. Next we decided to try out the indoor pool, which as you can see from the photo is at the end of the building with a fabulous view over the valley. The pool was a decent size too and each changing room had its own sauna, which is always good. By the time we were done with all this fun and games we were ready for dinner, which was served from 1900 in the restaurant. Dinner on Saturday managed to surpass the meal we’d enjoyed on Friday; this time we had trout for our starter, then asparagus soup and the tenderest veal fillet I’ve ever tasted. This really was a gourmet experience, and the chocolate mousse was the perfect finish. While we took the time necessary to regain the ability to walk after such a feast the girls went to investigate the children’s club which was in the room next door. Entertainment was provided both nights but on Friday we’d been too late; they had a fun time larking around with the other kids for an hour or so. The weather wasn’t as great on Sunday but the horse-riding was just as much fun; it was overcast and windy which prevented us from taking our planned walk together after the riders returned. Instead we decided to start our journey home and stop on the way back for lunch. It would have been good to go for a proper hike as intended but we’ll save that for next time. No nasty surprises when paying the bill, just the same excellent service from the charming staff. 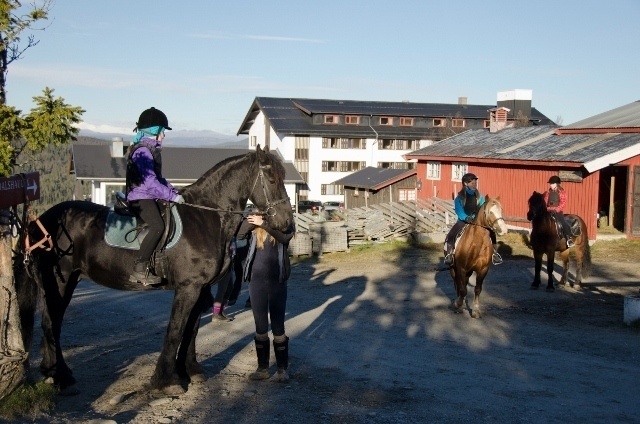 We were able to pay for the horse-riding (a reasonable NOK275 per hour per person) together with the hotel charges which was very convenient. You’ll not be surprised to learn that we loved our stay at Wadahl Høgfjellshotell. This really was a perfect weekend with something for everyone, and a valid alternative to a city break for a weekend away. 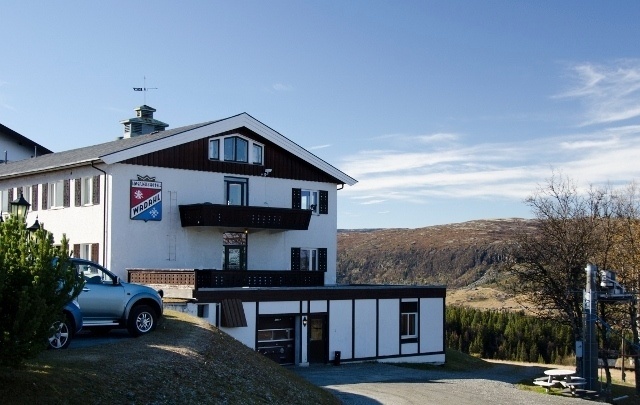 Given the ease of access from both Oslo and Trondheim it is really worth considering making the journey to Gålå to experience this excellent mountain hotel. 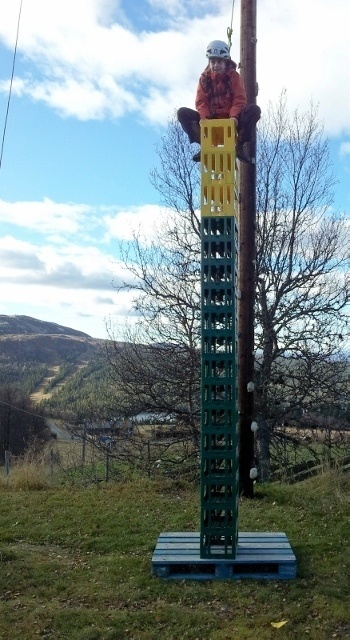 If you are travelling with children check for special offers and extra activities; in the winter this will not be an issue as there are miles of ski trails and pistes to explore too. We will certainly be back and next time we’ll look at a weekend in the snow at Wadahl. 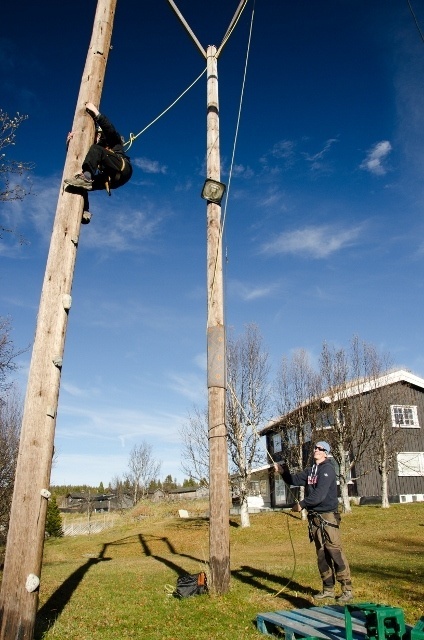 But whatever the season you’re sure to enjoy your stay, 933 metres above sea level in the Norwegian mountains.